The Java nextAfter Function is one of the Java Math Library function which is used to return the floating point value adjacent to the first argument in the direction of second argument. If both first argument and second argument is equal, then Java nextAfter Function will return second argument. In this article we will show you, How to use Math.nextAfter Function in Java Programming language with example. start: Please specify the starting floating point value here. direction: Please specify the direction here. Math.nextAfter Function will find the adjacent value or neighbor start argument and returns the output. If either of the arguments are not a number, java Math.nextAfter function will return NaN. If start argument is equal to positive or negative Double.MIN_VALUE and the direction argument has a value such that the result should have a smaller magnitude, then Math.nextAfter function will return Zero with same sign. If start argument is equal to positive or negative Double.MAX_VALUE and the direction argument has a value such that the result should have a larger magnitude, then Math.nextAfter function will return Infinity with same sign. If start argument is infinity and the direction argument has a value such that the result should have a smaller magnitude, then Math.nextAfter function will return Double.MAX_VALUE with same sign. Java Programming provides two different Math.nextAfter Java functions to find the adjacent floating point value in the direction of second argument. The Java Math.nextAfter function is used to return the floating point value adjacent to the first argument in the direction of second argument. within this Java nextAfter function example, First, We declared variables of type Double and Float to display the functionality of java Math.nextAfter function on different data types. 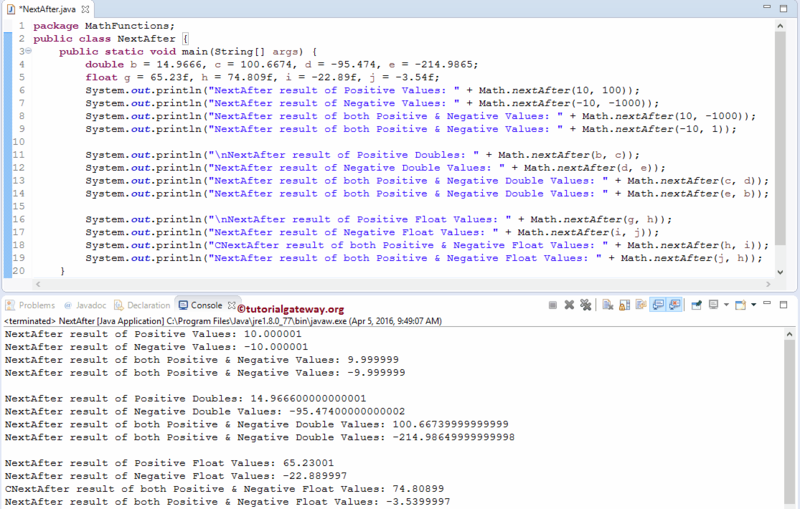 Next, We used the Math.nextAfter Function directly on both the Positive and negative values. Next, We used the Java Math.nextAfter Function on variable b, c, d and e (they belongs to double type). Following statements will call the nextAfter method of double type ( static double nextAfter(double start, double direction) ) to return the adjacent floating value. Next, We used the Math.nextAfter Function on variable g, h, i and j (they belongs to float type). Following statements will call the nextAfter method of float type ( static float nextAfter(float start, float direction) ) to return the adjacent floating value.